Tired of your outdated kitchen fixtures? Is your faucet leaking? Get professional solutions from your local Annapolis faucet, fixture, and sink experts. Call us today at (410) 268-7191. Click here to view our current specials and discounts. 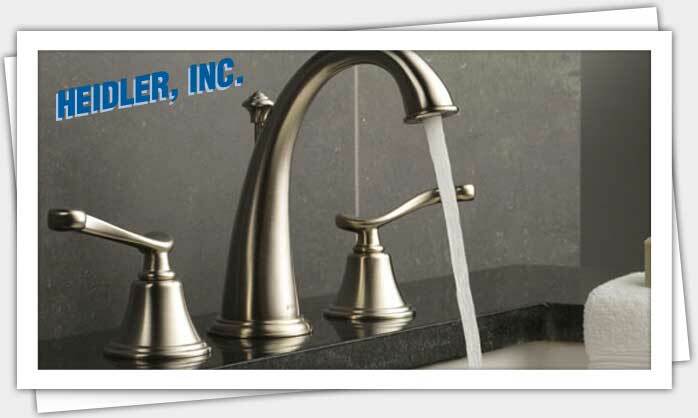 Heidler, Inc. has been in the plumbing solutions business since 1947. Your experienced Annapolis faucet, fixture, and sink experts will improve the look and function of your kitchen and bathroom with reliable repair and replacement services. Take a look at the latest customer feedback here in our reviews page. Do you have hard water? How does this affect your faucet? Over time, hard water can result in premature deterioration of your faucets. Hard water contains calcium and magnesium, among other minerals and contaminants. These materials eventually build up in your pipes and faucets, which can reduce water flow. Take a good look at your faucet and you may see limescale—a white, crusty substance. This is a sign of hard water taking its toll. A faucet with limited water flow due to limescale and other hard water elements will need to be replaced. Issues with water flow can result in a higher water bill. If it is difficult to turn the handles of the faucet because of residue buildup inside the fixture, this is another sign that it may be time to replace your faucet. Aside from function, many of our customers also decide to replace their faucets simply for aesthetic reasons. Adding a more modern touch to your kitchen or bathroom can have a great effect on your overall home comfort while providing you with reliable and efficient plumbing fixtures. Can hard water affect your sink? Hard water can also affect your sink, leaving a dark stain on the surface. This stain is difficult to remove; resorting to chemicals to clean it will only further damage your sink. Residue from hard water can also collect around the drain. This prevents water from draining easily and can lead to clogging—especially if your drain or sewer line is already blocked from mineral buildup or corrosion. Replacing your sink is the ideal solution if it is showing signs of wear and tear as a result of hard water. How can you avoid problems with your faucets and fixtures? Keeping your faucet well-maintained is an effective way to avoid issues. This includes installing a water softener system to combat the harsh effects of hard water. Contact us if you notice leaks, corrosion, or other significant damage to your faucets or fixtures. Our technicians will evaluate the condition of your system to determine if it will need replacement parts. If it does, we will carry out the service so you can avoid further problems.